I really seem to be drawn to making monochromatic cards. I'm not sure why, but often they are my favorites. This birthday card is the last one I need for January. Whew -- done just in time. I love these classes at Online Card Classes, and I could not resist taking this quick 4 day course all about the card insides. I have a few of my card making supplies here in California, and I am doing my best with homework. There were so many video's and card examples the first day, it was fantastic. Here is my card. Stamps and Dies from Simon Says Stamp. Thanks for stopping by. 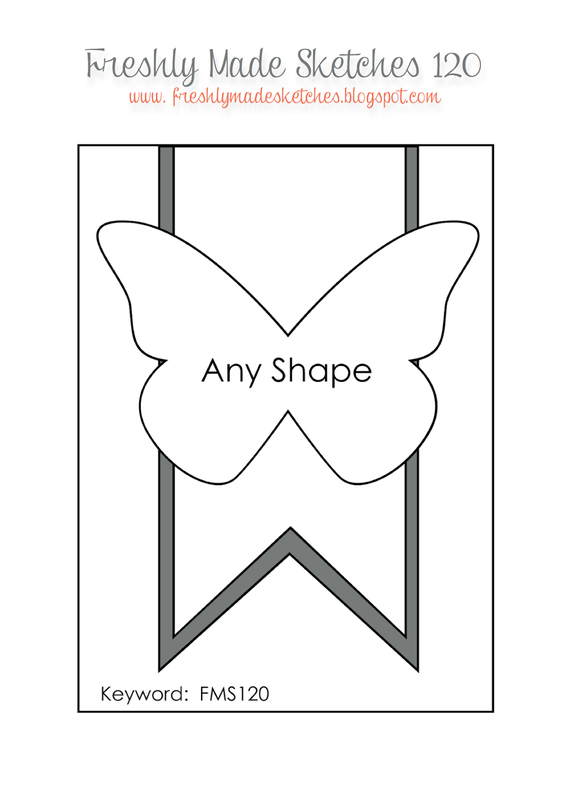 I've just caught up on my homework for the latest class Stenciled at Online Card Classes. I have two cards using two techniques. 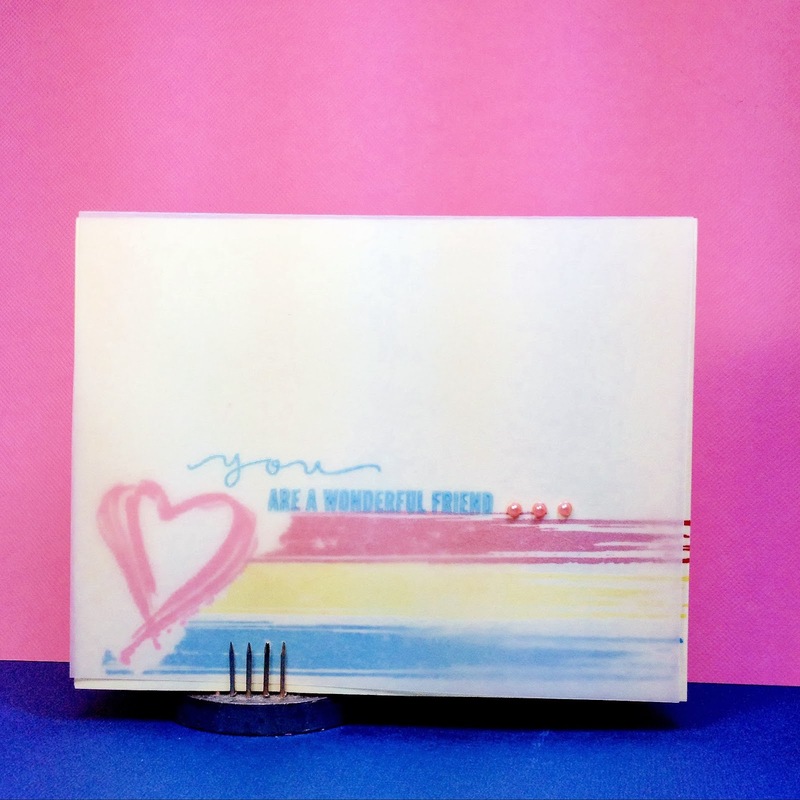 The first card is from our lessons on the second day, which showed several ways to use stencils by using watercolors, stamping, and coloring. I chose to emulate Kristina's card which she used water color pencils to simply color straight lines within the stencil. She made two lovely cards using hearts on one and stars on another. I had only one stencil which I though would work well with this technique, the Leaves Stencil from Simon Says Stamp. I used three green toned Inktense pencils to color the leaves, and a brown one for the branch. 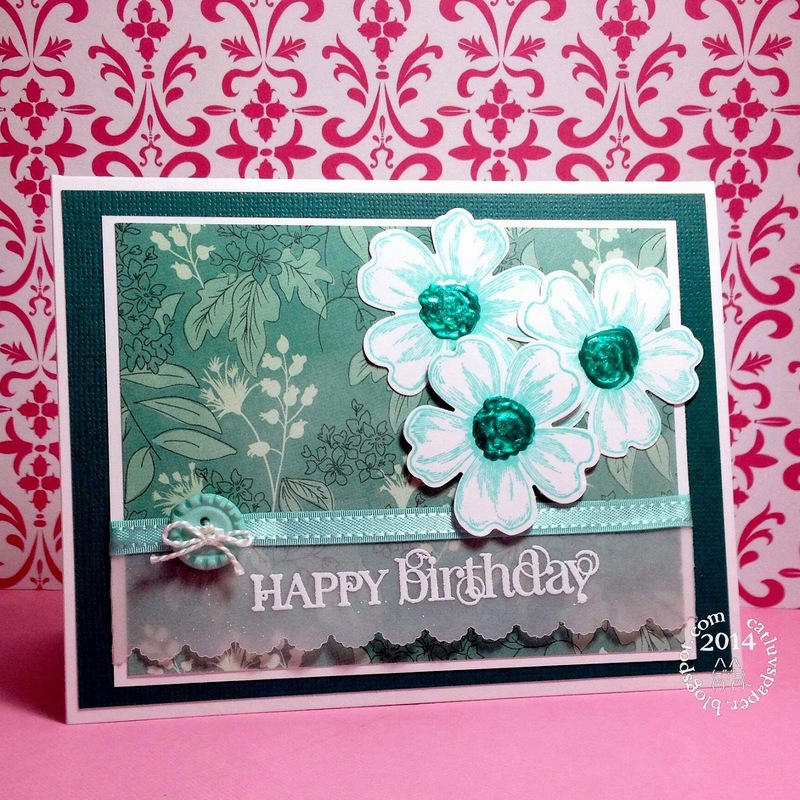 The flowers were die cut using a sizzix die, and the green centers are goosebump gems from Queen and Co. 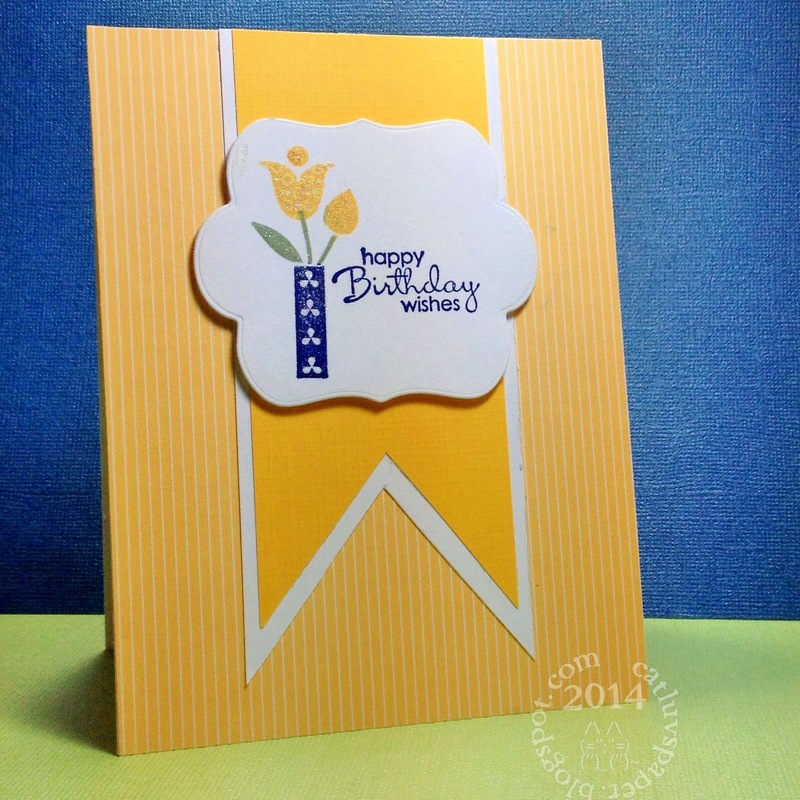 The sentiment is made with the Basic Grey letters included in the Februrary Simon Says Stamp card kit. Some papers were from the kit as well, and the remainders scraps. Day three was about texture. I tried adding glitter on top of the embossing paste...that was a disaster. So I started over and added some Hero Arts neon pink ink to the embossing paste. The color is a soft pink. 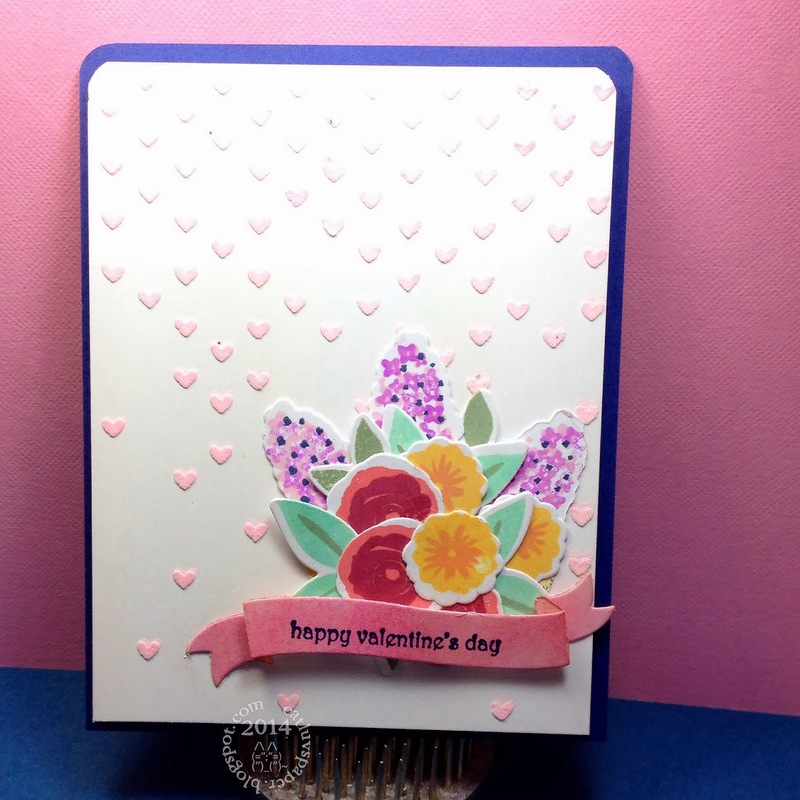 I used the Simon Says Stamp falling Hearts Stencil, Wendy Vecchi white embossing paste, WPlus 9 Fresh Cut Florals, and the Simon Says Stamp Tilted Banner. Sentiment is from Stampin UP Teeny Tiny Wishes. Again my cardstock is from my scrap pile. I was surprised at how quickly the paste dried with the addition of the ink. I did not put it on thickly, that probably helped it to dry fast. I am absolutely addicted to the Online Card Classes. This is my eighth class. 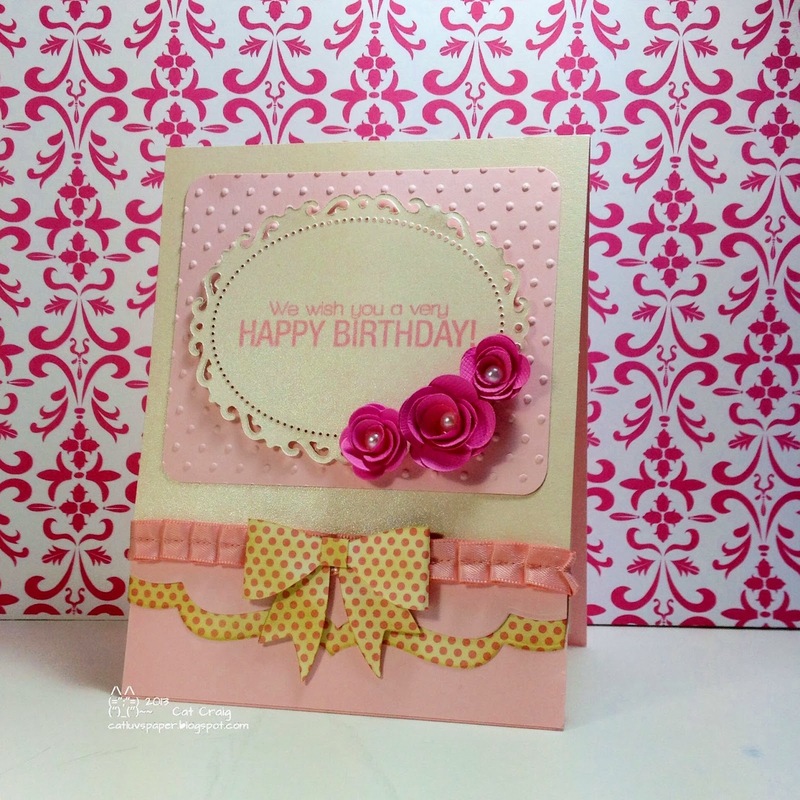 If you'd like to see cards from previous classes, just click on my fun classes page. It has the class logo and links to my posts for those classes. The current class is all about stencils. The first day is about inking and masking. I decided to emulate two of the inking cards. Once again I am only making the fronts, so I can keep them with my notes for later reference. 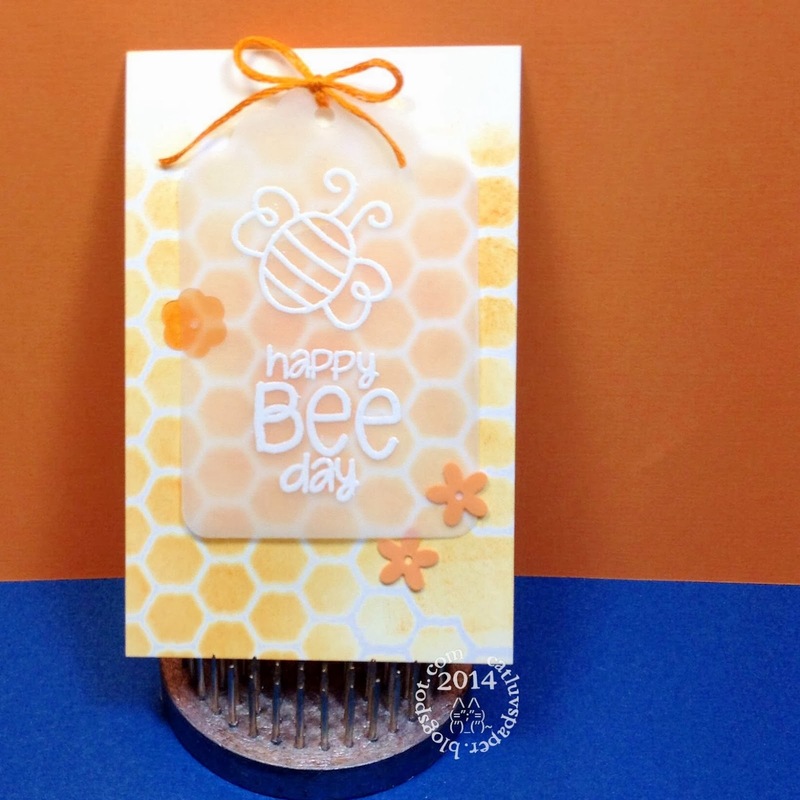 The Bee card follows Debby Hughes example and uses sponging over a mylar stencil with an embossed vellum sentiment tag. I used two distress inks and decide to cover most of the card because I made it tiny to fit my sentiment. Frankly, I liked the color behind the vellum, I am lover of yellows. Sentiment by Simon Says Stamp, Stencil by The Crafters Workshop, punch by Marvy. Sequins by Doodlebug. My second card follows Julie Ebersole's card and uses Hero Arts Stamps, Simon Says Stamp die, Spellbinders metal impressibility used as a stencil, Mists by Tattered Angels, and sequins bits by Martha Stewart. I sprayed 3 mists on to the cardstock with the metal stencil taped down. Metal stencils will not be forgiving to your sponges so paste or sprays probably work best with them. Nicest thoughts, a photo by Cat Craig on Flickr. My card for Leni's scramble. The theme was "wood". The scramble is 90 minutes for making, photographing, and posting a card made with the theme announced at the beginning of the time period. I made this card with hubs in mind. With the wood theme, I thought it perfect for a masculine feel. The cardstock is dry embossed with a sizzix wood grain folder, the hearts are die cut from balsa wood, and the stamp is Hero Arts K5878. I used a bit of distress ink on the dry embossed panel, hemptique natural twine, and white hero arts embossing powder on the main image. It's good to scramble again, although it really took me a while, this is version 3. The other two are in the scrap pile parts might be salvageable. Thanks for stopping by. I am playing along with Freshly Made Sketches this week. I need several birthday cards this month and sketches really help give me a kick start. 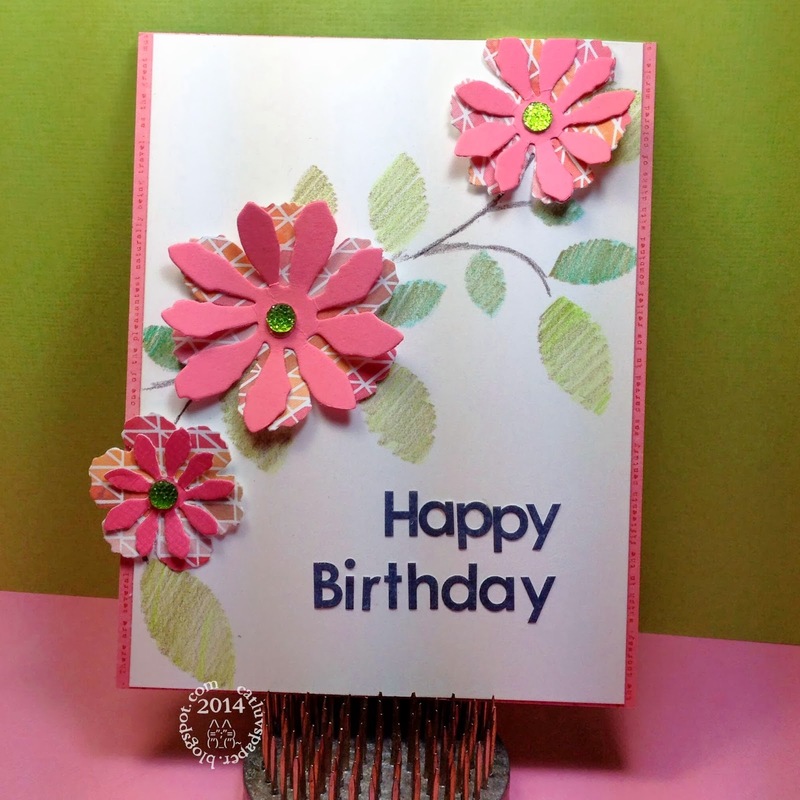 I broke out my Stampin Up stamps - Petite Pairs for the sentiment and Bright Blossoms for the image. 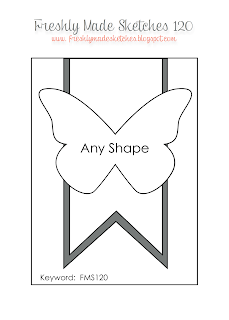 The die cut shape is from lifestyle crafts, and inks are from Hero Arts -Butterbar and Green Hills as well as Majestic Blue Versafine. 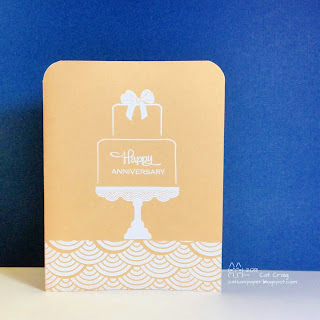 The cardstock is Neenah, and the patterned paper is Stampin Up. I though this cheery card would be great for a January birthday. Thanks for stopping by. 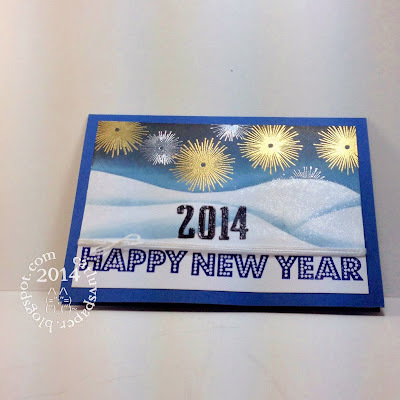 One of my goals for 2014 is to participate in more card challenges. While reading blogs tonight I saw the Runway Inspired Challenge # 52. The dress is gorgeous, filmy with strokes of color. So I dug out my Hero Arts Brustrokes stamp set which has seen far too little ink, and created this card. I used Brilliance Pearlescent inks in Yellow, Coral, Sky blue, and Poppy. To duplicate that soft breezy feeling of the dress I stamped and embossed my sentiment in the Sky Blue ink on top of vellum then adhered it over the top of the stamped card. What do you think? Can you see my inspiration in the dress? Thanks for stopping by. Hi everyone. In preparation of our trip to California for the holidays, I made lots of card and pre-scheduled blog posts. My last one on January 8th, when we were to return from California. We had flight delays and eventually arrived home in the pre dawn hours of January 9th. After some sleep, unpacking, and getting groceries in -- it became quite apparent that hubs had brought back more than just his luggage and memories. He had the ICK...aka the flu. I too soon fell to the bug and we have been knocked out for almost 9 days with this ICK. We are both on the upswing now; and things are getting back to normal. That explains my recent blogging absence. I have made a couple of cards but they are for exchanges so I cannot quite post them yet. Instead, I thought I would share pictures from our day trip to Pasadena. I lived in California for decades and had never gone to see the floats. It is a 90 minute drive to Pasadena, so we made the trip to view the parade floats on January 2nd. While our friends and family to the east were dealing with harsh winter weather we strolled about admiring floats and taking pictures in 79 degree sunshiny weather! I enjoyed the day tremendously. Below are pictures of some of my favorites. I hope to be back soon with some cards. Thanks for stopping by. My In-Laws celebrated their wedding anniversary recently. Hubs and I were heading to bed after a day of packing and getting ready for our trip to California to spend the holidays with my Dad. I woke up in a panic about 30 minutes after heading to bed...I had forgotten to make the anniversary card. I got up a bit earlier and headed to my craft room to put this together. 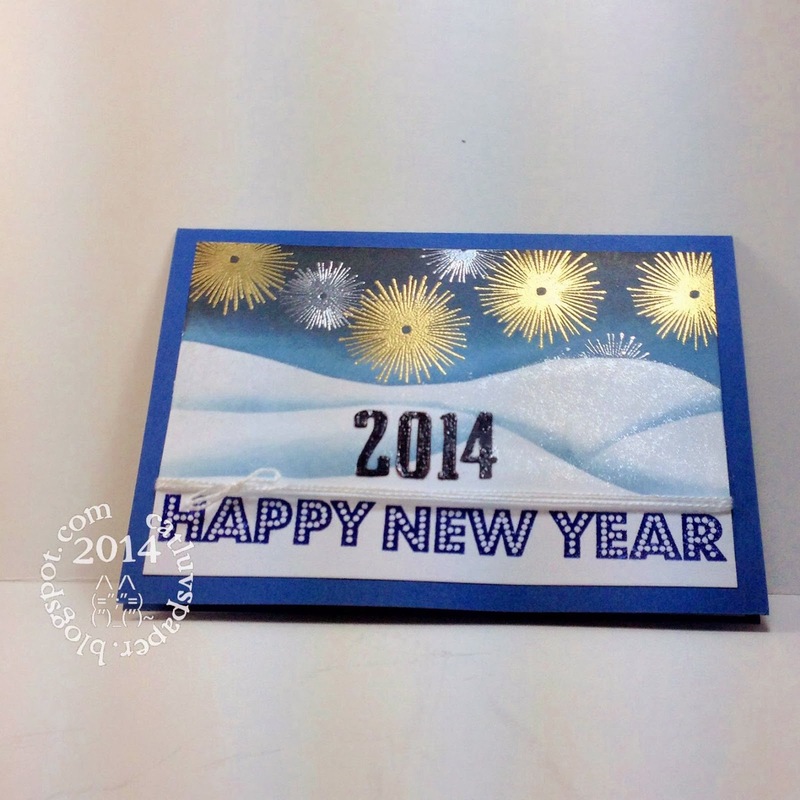 It is a simple white embossed card on a golden card base. The upper corners were rounded to mimic the cake edges. I love this stamp set from Avery Elle. Have a wonderful day, thanks for stopping by. My MIL has a December birthday. 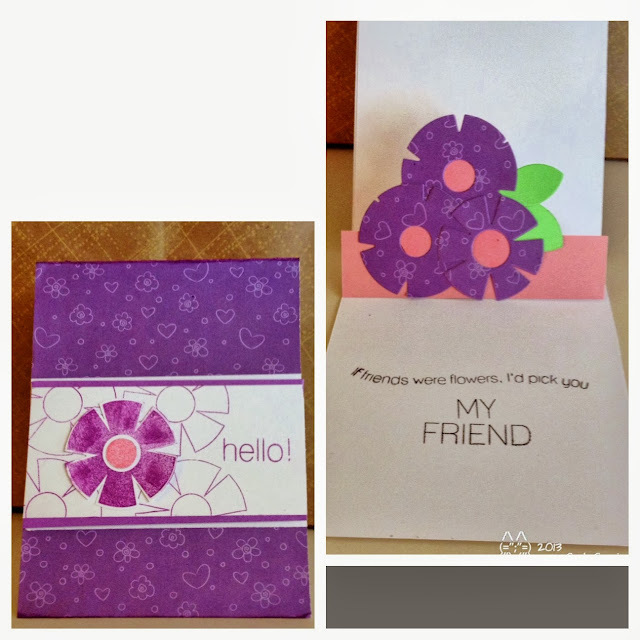 I try to do something different for her on each card I send. 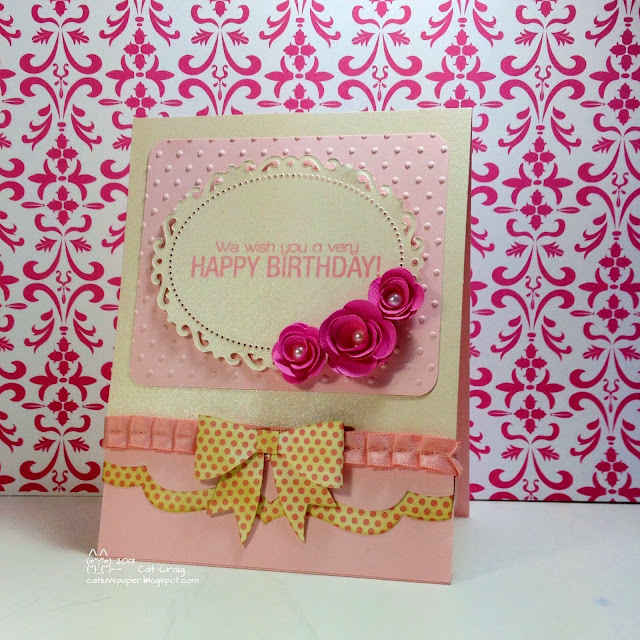 She loves pink, so that has to be a big part of the card. I bought this stamp set used, and I love it. It seems to have a lot of potential.